Episode 10: The gospel message says “Repent, the kingdom of heaven is at hand,” but after two thousand years, where is the kingdom? Episode ten will examine this conundrum by looking at these words of Jesus from a Jewish perspective. 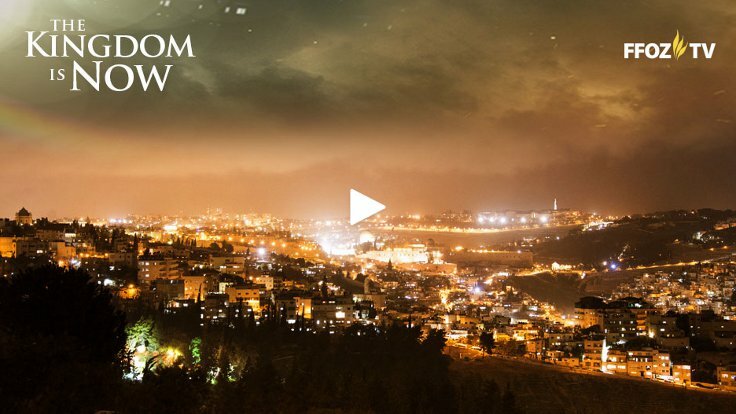 Viewers will learn that the kingdom did not arrive in Jesus’ day because Israel did not repent. However, all followers of Messiah can receive a foretaste of the kingdom now by repenting and attaching to the king now as they eagerly await his second coming. This episode continues to build on the previous ones having to do with exile and redemption, the ingathering of Israel, the Gospel message, and Jewish repentance. First Fruits of Zion (FFOZ) teachers Toby Janicki and Aaron Eby answer a question that has been of special importance to me. How can the Kingdom of Heaven, that is, the Messianic Era, be on the brink of arrival or at hand, and yet not have arrived in the past 2,000 years? The pacing of this episode runs a bit differently than previous ones. 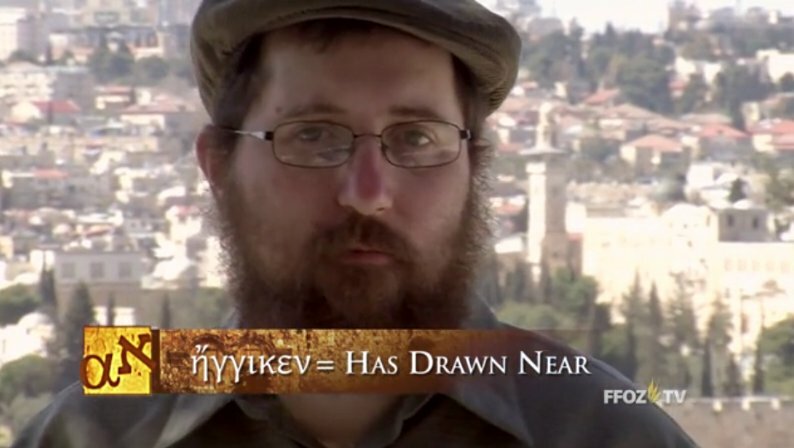 Even before Toby introduces his first clue in solving the mystery, the scene shifts to Aaron Eby in Israel and the Greek word used to impart the meaning that the Kingdom of Heaven is “at hand.” This word, Aaron tells us, more literally says “it has drawn near” or “it has drawn close,” which seems to indicate something came and has already passed by. 19th century translator Franz Delitzsch “retro-translated” the Greek back into the most likely form in Hebrew, which would be the idiom we would understand in English as “drawn near to come.” It gives the sense of something that is poised to enter, like a man standing outside your front door, close enough to ring the doorbell. However, that man hasn’t yet arrived until he is invited inside and goes through the doorway. If he hadn’t yet rung the doorbell or knocked on the door, even though he is literally close enough to touch, you wouldn’t even know he was there at all. Aaron says something important. The Kingdom of Heaven being “near” isn’t about time or proximity, but rather, accessibility and potential. The Kingdom wasn’t only sort of near 2,000 years ago and slowly coming closer with the passage of time. In a very real way, it’s always like the man standing just on the other side of your front door. He could knock at any second. But what’s stopping him? Wait a minute. How can Jesus say that the scribe wasn’t far from the Kingdom of God if “far” and “near” are a matter of the timing of Christ’s return in glory and power? It has to do with the heart of the scribe and his true understanding of the Torah. That, in and of itself, should be a bit startling to a Christian audience, since being close to the Kingdom is linked to both a repentant heart and correct understanding of the Torah of Moses. According to Aaron, deliverance is on the threshold of being revealed. It is here and accessible at any moment. The person or people involved just have to become aware of it and then touch it. As I said above, the Kingdom is at the door poised to knock and is already knocking. All we have to do is open the door and it will arrive. All we need is to have the right heart and the right understanding of what God is telling us in the Bible. And here’s our first clue. Clue 1: “At hand” means God’s Kingdom, the Messianic Era, was on the brink of being revealed. I’m trying not to give too much away in advance of the other two clues, but the revelation of the Kingdom is something that Jewish people have been waiting for longer than there has been anything called “Christianity.” Even in Jesus’s day, once he was resurrected, his disciples expected the Kingdom to arrive immediately. They even asked him about it. It was puzzling when Jesus didn’t summon the Kingdom right away. Yet not only did Messiah’s disciples expect the Kingdom to arrive right then, so did Jesus. Toby says that it was Messiah’s intent to bring the Kingdom to the generation in which he lived. What stopped the Kingdom’s arrival? It is said in some branches of Judaism that if all of Israel were to repent at a single moment, it would summon the arrival of Messiah. Toby says something very similar. He teaches that the arrival of the Kingdom of Heaven is contingent upon the repentance of the generation, and although he didn’t make this explicit, the generation of Jewish people. In other words, if all of Israel, the Jewish people, were to repent as a single body, the Messiah would come. But remember, as we saw in last week’s episode, Jewish repentance does not mean simply coming to faith in Jesus Christ, and it definitely doesn’t mean forsaking the Torah of Moses and becoming goyishe Christians. It means repenting of sins, returning to the Torah, and having a profound faith in God. With Yom Kippur just days away, this message is extremely well timed. Perhaps Messiah will come one year during the Days of Awe, when all of Israel makes teshuvah and returns to God. Why didn’t the Messianic Age arrive with the first coming of Messiah? Some Jewish people repented, but Toby says most didn’t. They weren’t ready. As Toby was talking, I started to think of that first generation of Israelites Moses liberated from Egypt. They had been redeemed but they too were not ready to enter into the Land. Only the generation after them was ready, and they were the ones who received the promises. 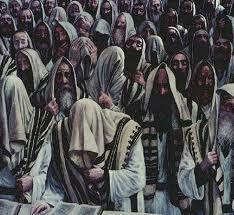 Which generation of Jews will be the ones to usher in the Kingdom of God and Messiah’s reign? Clue 2: The Messianic Era requires repentance. Again, I believe this is specifically Jewish repentance, and I believe the unique role of the Gentile Christians, the people of the nations who are called by God’s Name, is to encourage and support Jewish return to God and the Torah within a Messianic framework. Only then will the Messianic Era arrive. But will that ever happen? The necessary repentance hasn’t occurred in the last twenty centuries. Can the Kingdom of God be near to people now as it was to the scribe to correctly interpreted Torah with Jesus? 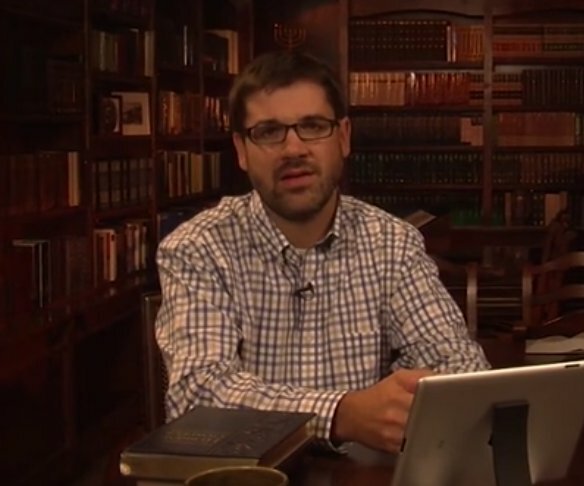 Christians are used to “beating up” the Pharisees, and believe they are nothing but hypocrites and liars, but here, Toby tells us they were asking a sincere question about the coming Messianic Age. Jesus gave them a sincere answer. Like the scribe, if they turned to God and Torah with a repentant heart, they would benefit from the blessings of the Messianic Era right now. They, and all believers, become a foretaste of the Kingdom in the present age. In that sense, anytime that believers in Jesus exist, some part of the Messianic Age of Jesus is always present. Clue 3: Followers of Jesus who heed the message of the good news and repent are the Kingdom in the current age. Toby describes the Kingdom as the Land and the People under the rule of the King. While we have a foretaste of the Kingdom in our lives as believers and we thus can share the Kingdom with others, it won’t arrive as a physical reality until Messiah arrives and rules as King in our world. Think of the first coming of Jesus as his planting a seed. The seed is underground. It’s present. It’s real. It’s close enough to touch, but it’s still out of sight. If you didn’t know it had been planted, you wouldn’t know it existed at all. We believers are here as gardeners to nurture the seed and to help it grow. But like a tiny mustard seed becomes a great tree, the reality of the Kingdom won’t burst forth from the seed, escape the bonds of the earth, and reach for the sky in magnificence until the Messiah’s second coming. As I’ve said previously, this is a little hard to take, because if the timing of the arrival of the physical Messianic Kingdom is totally in the control of the Jewish people and their repentance, then, depending on when they repent (or repented if it happened in the past), the understanding of these realities may or may not have been or be available to the people of the world’s nations. Jesus could be saying that the Father knows the exact time of the return, even though it is in the hands of the free will of the Jewish people. Certainly, if I accept the FFOZ understanding of the coming of the Kingdom, then it sets a specific course for we who are believers in Jesus now. We can wait and wait and wait for Jesus to return and experience the foretaste of the Kingdom in our present lives, but Jesus will never return in the sky in power and glory until Israel repents. All this means that we Christians have a duty to support and nurture the Jewish people in their faith in God and in the study and performance of Torah so that they can arrive at repentance. But as my Pastor often asks me, what exactly is the Torah, relative to the many traditions and customs of the different streams of Judaism in our day? What exactly must we do to encourage Jewish repentance so that the King will return and take up his throne? I’m not sure what your pastor’s point is by saying “what exactly is Torah” and I don’t get the benefit of his tone on a blog post, but it seems a bit troublesome, especially since Christianity is far from united regarding our various “streams” (some 40,000 sects) of “traditions” and “customs.” Protestantism is a somewhat “new kid on the block” and didn’t “arrive” for some 1500 + years in order to eventually morph into what he follows (Baptist). But the 2nd question should be self explanatory. We are commanded to love and show mercy. So, rather than going into any of the myriad of long-ago examples of Christian hatred and persecution of Jews for an example, I’ll stick to a more modern event: The Holocaust. If Christians hadn’t been “primed” to believe Jews “had it coming” and interpreted this horrific action against them as “God’s judgment” for killing Jesus, then perhaps more Christians would have loved them (Jews) enough to refuse to participate in their demise, by direct action—or inaction. If not “primed” to make life difficult for Jews and force them to suffer, via Martin Luther and others, perhaps enough Christians, both in Europe and abroad, would have shown the courage to actually prevent the atrocities all together, thereby proving we belong to the one who said to love one another. We know there were faithful Christians who did sacrifice all to protect Jews and there were literally many thousands who were saved, but what if it was millions saved? What would Jewish / Christian relations be today if it had been like the fantasy I just wrote? What if education and the “enlightenment” brought Christians to repentance for all they’d done to Jews in the past, and when the holocaust began to dawn, they squelched it? I think at the core of the question “What is the Torah?” or more accurately, “What is the purpose of the Torah?” is the attempt to answer the question “Are Jewish believers obligated to observe the Torah mitzvot?” He’s trying to work his way through Rabbinic Judaism and the large collection of laws and interpretations of the Rabbis including the kapparot so we have a common understanding of the topic. Personally, I think we can only partially answer such questions, since Torah has multiple functions across situations, populations, and cultural and historic contexts. Well, forgive me, but this seems so strange. God says they are to observe His commandments (oftentimes “for all generations”) → we say we believe the Bible is God’s Word → we proclaim they shouldn’t keep God’s direct commandments. Further, we create Biblical applications for ourselves that aren’t clearly spelled out, give ourselves status and blessings that specifically belong to them yet deny the “plain” meaning of the text. You have to get deep into the traditional Christian mindset to understand how it is even possible to believe that the Torah is supposed to become obsolete thanks to Paul. This is at the heart of my conversations with my Pastor. Lol, trust me James, I was there for decades. I’m pointing out the obvious and glaring problems with this mindset, but until someone points out the obvious, in a cut and dried way, it’s difficult to break the trance. Paradigms are tough to shift. Paul warned, for three years with tears, daily, that following his death, wolves would come in and not spare the flock. Perhaps it isn’t paradigms, but rather, “Flesh and blood have not revealed this to you, but my Father who is in heaven.” It is revelation, if one will receive it, or not. These questions might be helpful: Can you accept that what you have been taught, and believe, may be in error? If so, would you want to know? According to Ezek. 36:24-28 it will happen on God’s time. He is in control. Well, maybe one thing Christians can do, to help bring more Israelites back to their Land. @Chaya1957: The paradigm shift I was talking about was my Pastor’s or really any traditional Christian that struggles to consider that corporate Israel, the Jewish people, continue under the Sinai covenant and are obligated to the mitzvot. Do I consider that I could be wrong? All the time. That’s why I’m always asking questions. What would I want to ask God if I could ask Him everything? The short answer is “Everything,” but the reality is that He tells me everything I need to know, just not everything I want to know. @Dan Benzvi: Ezekiel 36:22 and beyond seem to indicate that God rescues Israel from exile for the sake of His own Name, which I guess could mean that God is controlling the exact timing, but verse 37 seems to say that God is responding to what Israel is asking. Yes, Christians can and should encourage the Jewish people to make aliyah and return to their Land but I believe that also includes Christians encouraging Jewish people to return to the Torah as part of God’s plan of redemption for Israel. The record in the Tanakh seems clear. Whenever Israel abandoned God and the Torah, they were exiled. Whenever they repented and returned to God and the Torah, they were returned to their Land. So, thats an interesting question James. What does your pastor think of Ez 36 (and all of the other passages in Jeremiah, Isaiah etc) that point to the fact God is upset they turned away from Him (by disobeying His commandments i.e., the Torah they were told to “live” by)? If he thinks more dispensationally, then my question would be: if Israel is in exile and enduring punishment for disobeying the Torah, how is the “remedy” for this problem to continue to disregard the Torah? Of course he’d most likely say that they must become Christians and then their Torah disobedience is perfectly acceptable, and even mandated. But still, even under that paradigm, large chunks of scripture remain unfulfilled. @James, I wasn’t referring to you, considering the idea that one might be wrong and the other person right in some respects, James 3:15-18, but those who you are speaking with. In other words, is the conversation just for the pastor to defend his views, or is he open to exploring outside the boundaries of his doctrinal box. Already I see those among the Jewish community crying for Messiah to come. They may not know his name, but many yearn for his appearance. A rabbi was talking about 9/11, and how we all remembered where we were when this occurred. He said, “May we and our children merit to remember where we were when Messiah came. Baruch habah b’shem adonai! I noticed Yeshua is quoting Psalm 118. Blessed is the one who comes in the name of the LORD; We have blessed you from the house of the LORD. See, the temple must be rebuilt, and the cry of blessing come from those within the temple. @Ruth: Pastor is more of a dispensationalist, which means he doesn’t believe that the Church replaced Israel in the covenant promises. 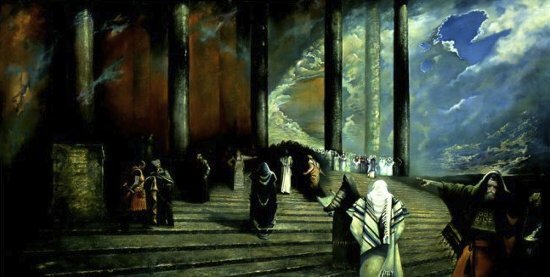 He does believe that the Torah was intended to be temporary, but interestingly enough, he believes that at least significant portions of Torah “come back” when Messiah does, such as the laws having to do with the Temple Messiah will rebuild. I know what you’re saying and it seems clear to me, but he points to Romans 4 and Galatians as evidence to support his viewpoint. @Chaya1957: It’s OK. I really do question whether I’m right or wrong. I think any reasonable person should regularly “take the temperature” of their convictions to make sure they (we, I) haven’t gone off the deep end. You bring up an interesting point with your comment about the Rabbi and Psalm 118. Maybe the Jewish people are beginning to fulfill Yeshua’s prophesy. Rav Yeshua’s comment about not being seen until Israel says “Blessed is he that comes in the Name of HaShem” is probably a coded reference to the notion that Israel in the aggregate must appropriate the full kavanah and significance of the Hallel psalms that are recited regularly each Rosh Hodesh and on the festivals, which begin with that passage. When such a depth of understanding becomes common (along with an understanding that the real Rav Yeshua is not the familiar Christian version), then it will become possible to develop a proper view of him. The modern representatives of the audience to whom he addressed his remarks will then be able to “see” him. Whether this will also tie directly to his visible physical return I cannot say, but I wouldn’t rule out such a likelihood. I would say, compared with my experiences growing up in the Jewish community, and through the years, that a shift in the atmosphere is taking place. Jewish people from all the various segments appear to be having these sorts of thoughts. I am aware that we (including me) see as through a glass. I also need to keep in mind the Hebrew vs. Greek thinking issue. Greeks learn to understand; Hebrews learn to revere. Still too much Greek in me. The DNA is Hebrew, but the education and socialization is Greek.